Josh Turner (born Joshua Otis Turner, November 20, 1977 in Hannah, South Carolina) is an American country music singer-songwriter. Josh Turner is a country artist who describes his music as South Carolina Lowcountry. His voice and musical style has often been compared to that of Johnny Cash's. Hailing from the Hannah, South Carolina, Josh moved to Nashville in 1996 to study music at Belmont University. It was there that he met his current wife, Jennifer Ford, whom he married in 2003. During that same year, he released his debut album, Long Black Train. 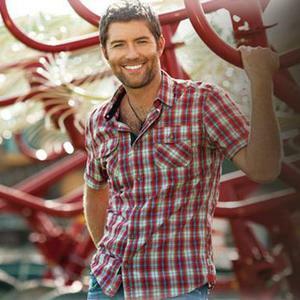 Josh Turner is a country artist who describes his music as South Carolina Lowcountry. His voice and musical style has often been compared to that of Johnny Cash's. Hailing from the Hannah, South Carolina, Josh moved to Nashville in 1996 to study music at Belmont University. It was there that he met his current wife, Jennifer Ford, whom he married in 2003. During that same year, he released his debut album, Long Black Train. The title song "Long Black Train" peaked at #13 on Billboard's US Country chart, staying on the charts for over 40 weeks. Your Man, Josh's 2nd album, was released early 2006. The first single was the title track, "Your Man," which eventually climbed all the way to number 1. His big hit, though, was his second single, "Would You Go With Me." This song solidified the album's soon platinum status. His Christian-themed "Me And God" was released as a single on the christian radio circuit. It was a moderate success, and was eventually released as a single on the Country radio.